"We need to change the name of ‘Biryani’ (Indian meat-rice dish), it sounds foreign,” I told my wife, who looked at me as if I had lost my mind. “I believe the name originates from the Persian word, Biryan or Beriyan, which is to roast or to fry. 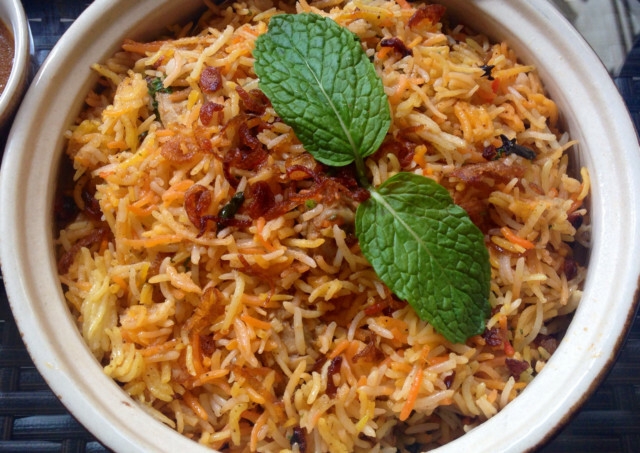 One historian says that Biryani was developed in the royal kitchens of the Mughals and is the rich mix of the spicy rice dishes of India and Iranian ‘pulao’,” I said. (According to start-up execs, Biryani is the most ordered online dish in India, not pizza, potato burger or ‘dal makhni’). “Do you know there is also vegetarian Biryani, which is truly ‘desi’,” said my wife, trying to irritate me as she knows I can’t much stand veggies. “Did you know ‘kabab’ or ‘kebab’ is also foreign and I think it was invented by the Turks who needed something that was not messy to eat while on the march to conquer new lands,” said my wife, looking into her laptop. “BTW [my wife speaks to me like she is texting me], why is everyone suddenly interested in changing names of everything?” she suddenly asked. “So, if I get a new cat, won’t I be able to name it Zeenat, after the Empress of the last Indian Mughal emperor?” she asked. “I tried changing my name in Canada, remember, when I was not getting a job, but it did not help,” I said. Many new immigrants from India were sure it was their name that was hampering their job prospects and changed their long names to something simpler like, ‘Mo’, ‘Sid’, or ‘Jeff’. There were some who resisted getting assimilated into the Canadian ‘khichdi’ (multicultural mix) and protested that if the Polish, with their tongue-twisting names such as Szczepan (for Stephen), had not changed their name, why should someone called Sudershan Subramaniam Swamy do so? “Stop dissing my name that your relatives cannot pronounce and think of what to name Biryani instead, that will make it sound more Indian,” I said.